Modifications to a vehicle is commonplace. But sometimes, in order to realize what is coveted, often make the modification processes bumping the logical thinking. Everything of course for the sake of one thing, ie to be the center of attention. It's could be seen on a motorcycle that has undergone a process of super extreme modification. 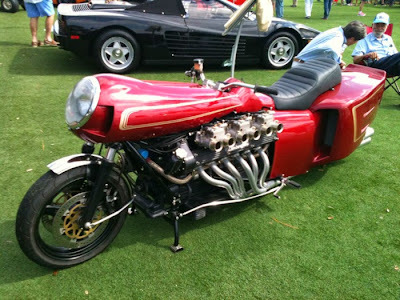 Last year, the bike looks so scary because carrying a ferocious V12 engine of the Lamborghini Espada (looking at the bike scary face). Now, the bike back into the limelight after getting new suits in the form of the retro-style fairing. As reported by Autoevolution on Tuesday, May 19, 2015. It turns out, the man who built this eccentric motorcycle named Chuck Beck. He is known a very fond of an extreme-style motorcycle. Not surprisingly, then he makes this bike as his madness matter. Motorcycle appearance is very unique. 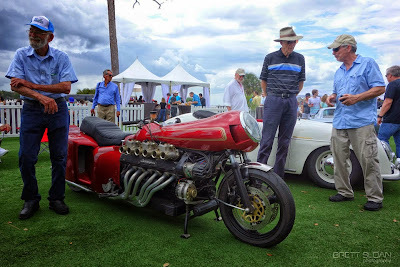 Its great body looked describes the engine muscles complete with six carburetors and throttle. The bike comes more beautiful thanks to the presence of red color in the whole of the body, completed with gold accented line. However, the uniqueness in the motorcycle is still maintained, where the front tire and handlebars was far apart. Front tire remain on the mainstream position, while the handlebars are in the middle of the motorcycle's body, close to the engine. As a result, the biker will ride the bike of the middle of the vehicles. Another uniqueness is the motorcycle exhaust which looks like women's hair, that long dangling. What about its sound? Of course this motorcycle has a sound that could make your heart beat loudly. 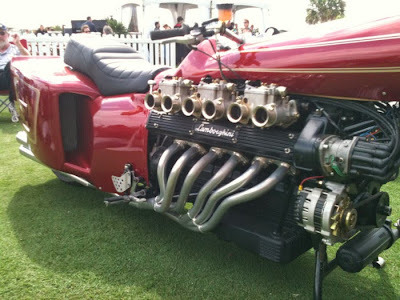 As an illustration, the engine that is pinned on the bike is a machine with a capacity of 6.5 liter, 12-cylinder. Normally, this machine can give the power up to 700 hp with a maximum torque of 690 Nm.